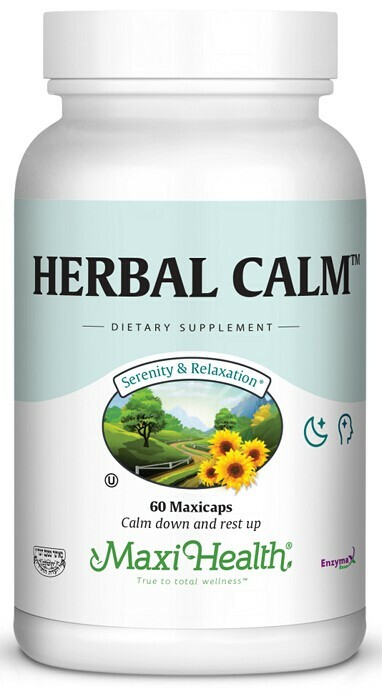 Herbal Calm™ by Maxi Health is a combination of St. John’s wort, passion flower, and valerian root. Stop fussing with three different supplements. Take one (1) or two (2) Maxicaps™ twice daily or as directed. Other Ingredients: Rice flour, vegetable cellulose, Enzymax® (calcium carbonate, bromelain, papain, lipase, amylase, protease, silica). Note: If pregnant or nursing, consult your healthcare practitioner before using any dietary supplements.